If you’re anything like me, you appreciate nail art, but you don’t have the patience to make mini-paintings with a measly toothpick. 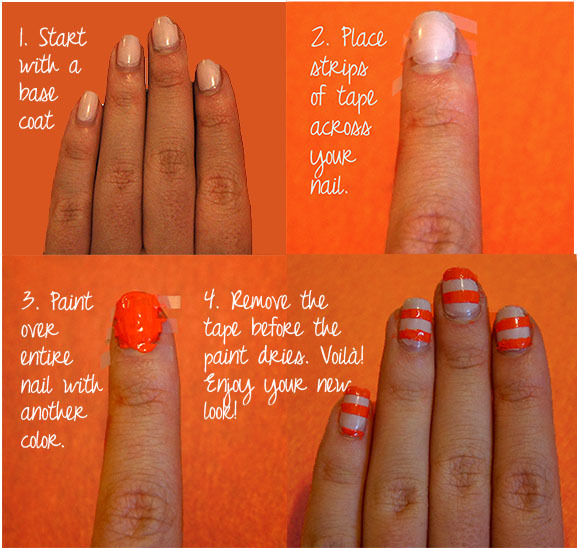 Here’s a nail tutorial that is still creative and fun, minus the difficulty. Go nautical with blue & white, classic with black & white, or come up with your own color combination! 1. Paint your nails with the first color. In the pictures above, I already had my nails done…it was a great way to revive a dull and aging manicure. 2. Cut stripes of tape to the desired width of your stripes. The area under the tape will be the color of the base polish. Make sure that when you place the tape on your nail there are no air bubbles, you don’t want the polish to get under the tape. 3. After you have smoothed down the strips of tape, paint your entire nail with the other color. 4. Wait for a few seconds and then carefully remove the tape. This entry was posted in Primp and tagged diy, nail art, nautical, polish, stripes. Bookmark the permalink. Love this! Do you have any tips for more tape designs? Thank you and yes, I do! I’ll be posting a new tape design tutorial on Monday.